Last weekend my Husband and I went cherry picking. It seems a little early this year. Living in Buffalo, cherries didn’t go into season until the 4th of July. We picked 10 pounds of cherries. Sheesh… I went a little greedy and now I have to figure out what to do with all of these cherries. Well my first idea was Cherry Crisp. Yum! I love Crisps! They are one of my favorite desserts to make with fruit. 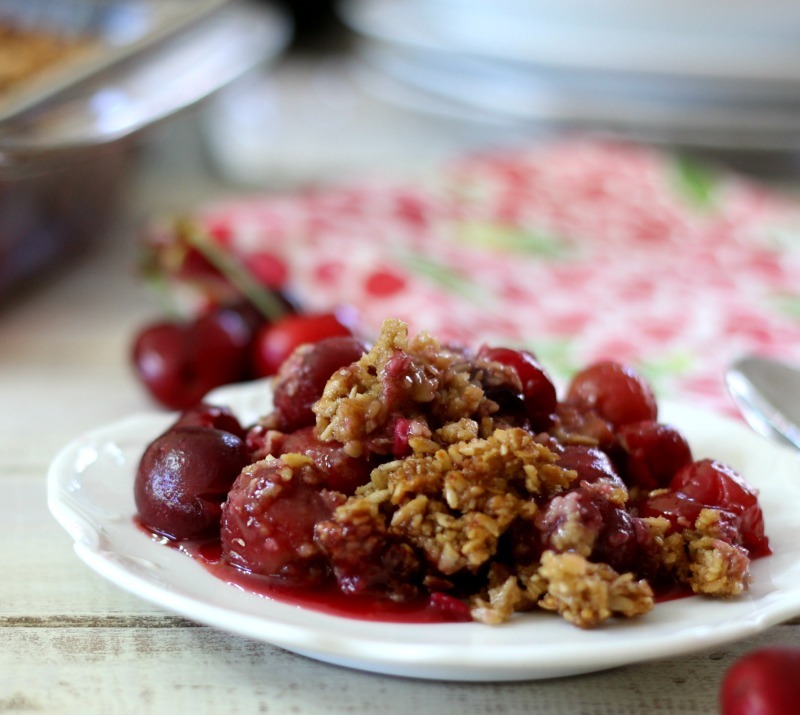 The Cherry Crisp is sweet but too sweet. The cherries are fresh and I added just a little bit of sugar to them. 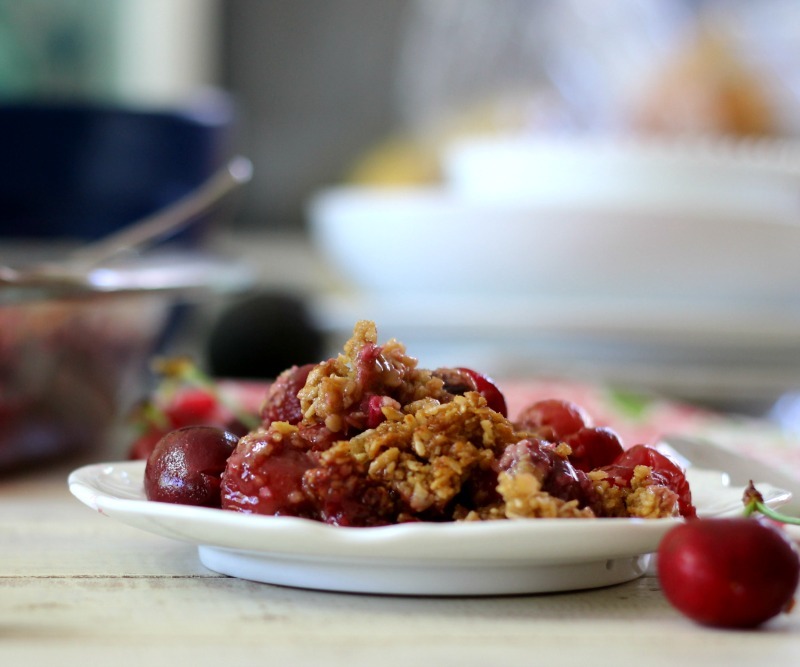 If you have tart cherries you may need to add a pinch more sugar. The topping is an amazing brown sugar, oat and butter topping. I swear I could scrap the topping off and eat it with a spoon. I was going to use Old Fashion Oats, but I decided to use Coaches Oats instead. I am very happy I did because it added such a nice crunch to my topping. The cherries turned out nice and juicy. Lots of juice at the bottom of my baking dish. It’s perfect for drizzling over ice cream. I have to admit this is probably my favorite crisp. It tastes like summer and is so filling too. 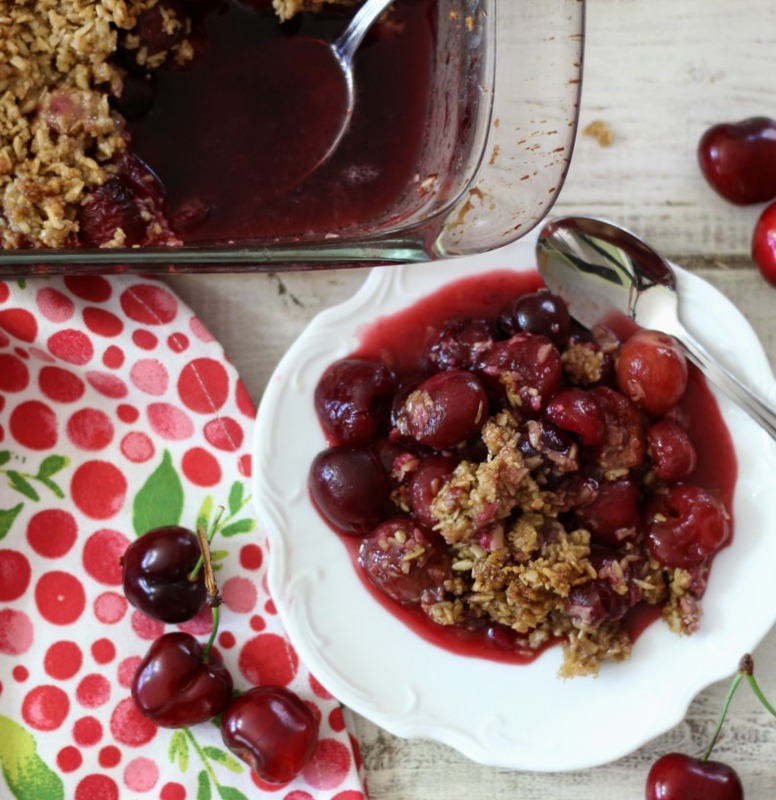 If you use fresh cherries in this recipe, I recommend getting a Cherry Pitter. It makes life so much easier. I used OXO Brand Cherry Pitter (see photo above for what a cherry pitter looks like) that I bought at Target for just under $10.00. I kid you not I spent about a half hour pitting the cherries. I used 12 cups in this recipe. Now you could cut this recipe in half by using an 8 x 8 baking dish, but I went big! I used a 9 x 13 baking dish. I wanted a lot of crisp. It’s perfect for feeding a crowd or me! 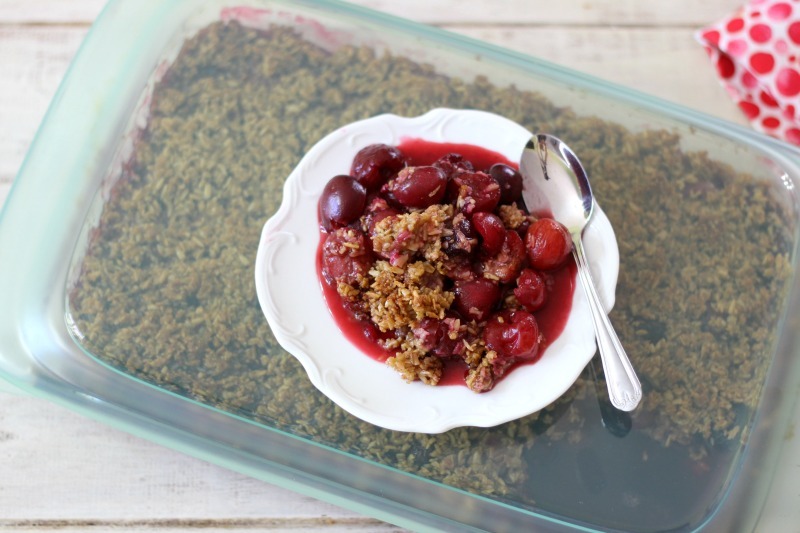 Sweet juicy cherries that were baked with an oat and brown sugar crumb topping. Perfect for serving with ice cream. In a large bowl, add cherries, cornstarch, ¼ cup granulated sugar and almond extract. Mix until combined. Pour into prepared baking dish. In a medium bowl, add Coaches Oats, flour, brown sugar, salt and butter. With a pastry blender or your hands, mix until crumbly. Evenly sprinkle onto cherries. 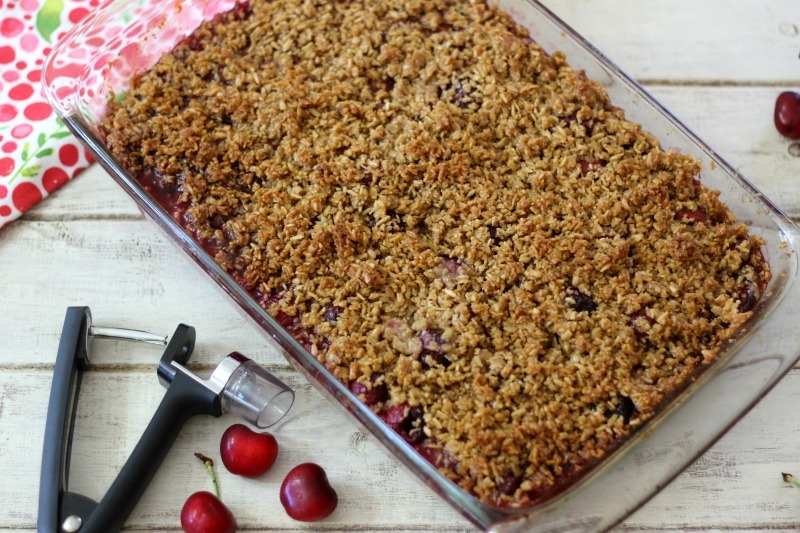 Place in the oven for 40 - 45 minutes until top is golden and cherries are bubbling. Let cool to room temperature and serve. 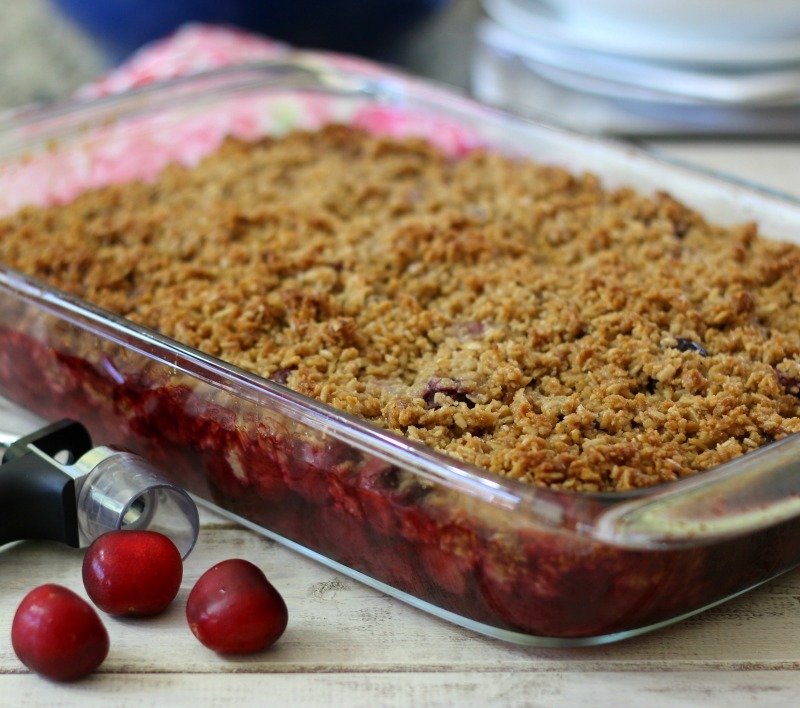 I baked my Cherry Crisp in a Glass OXO Bakeware and SNAP Glass Food Storage 13 x 9 Baking Dish. I love this dish because it comes with a lid. It goes from oven to refrigerator without going into a thermal shock. It can with stand up to a 250 degree Fahrenheit of temperature change. But I love it because of the lids. It’s so much better than using foil or plastic wrap that can get so messy to use. The cover makes it for easy storing. I also don’t have to worry about food smells getting into my food that I store. 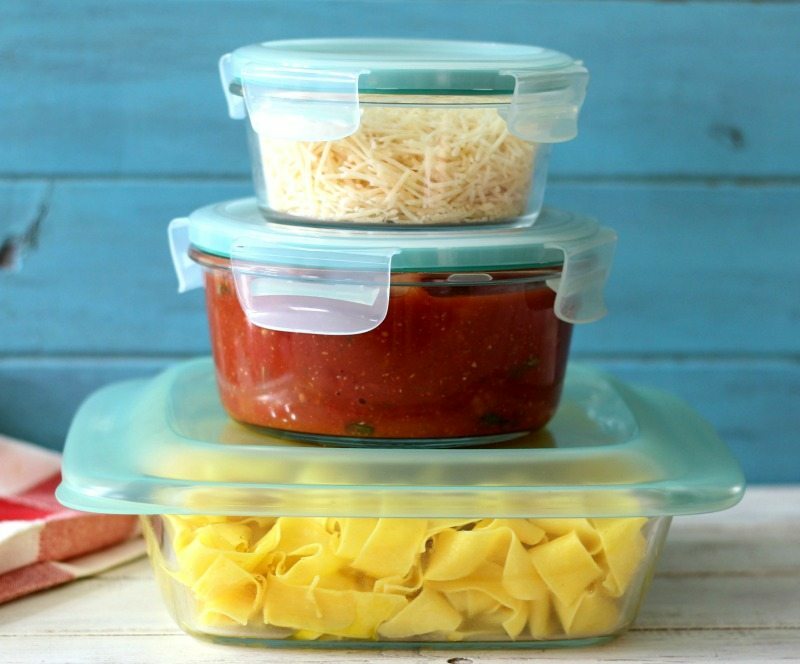 The lids easily snap, stackable and nestable, Microwave safe (just undo the tabs first!) and leak-proof seal. So perfect for me and my family. I wanted to share with you my new find. OXO 14 Piece Glass Bake, Serve & Store Set. 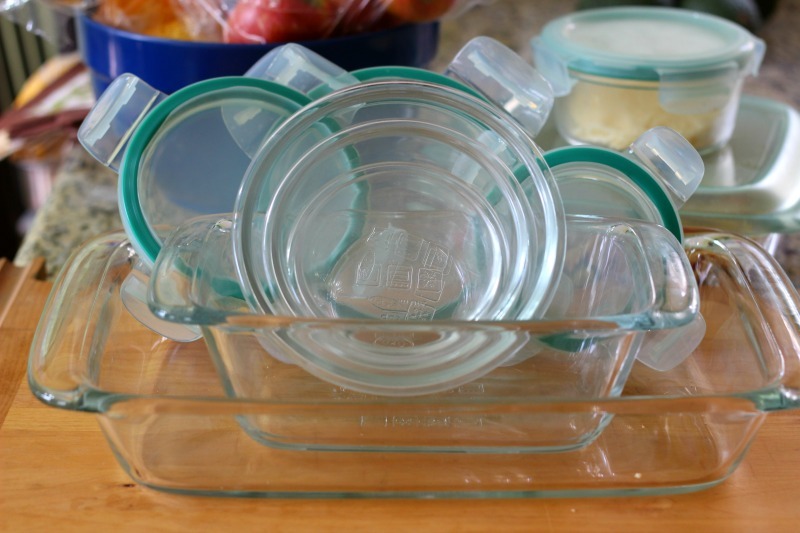 You may have noticed on a past few recipes I have been prepping my meals and storing them in my OXO Piece Glass Bake, Serve & Store Set. I’m telling you it is one of my best items for the kitchen. I actually keep them stored on my counter because I use them so much. 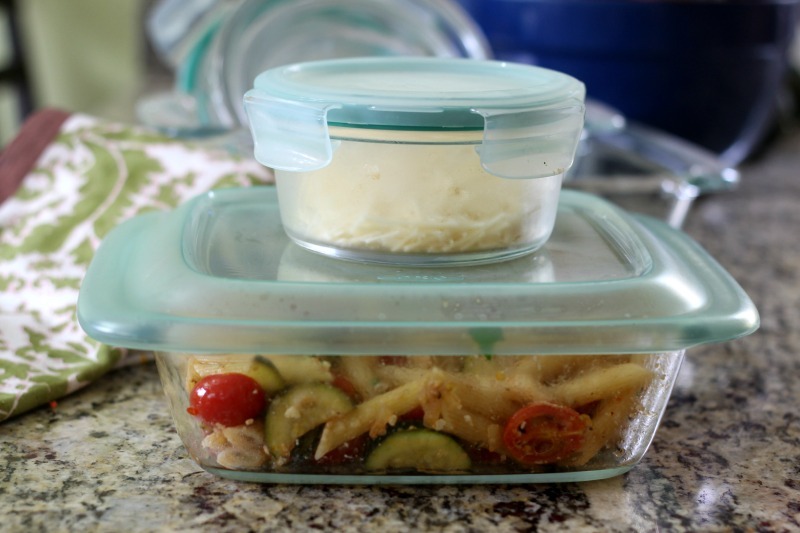 Here are a few other recipes that I used my food storage for. This post is sponsored by OXO. I received free product in exchange for a post. All opinions are my own. I will be honest, I love this set!! I did not use a cherry pitter. I live in the county to far to get one. I saw a hack to use a straw that came out of one of the plastic cups. It poked the pit right out. Worked grest and the straw could stoll be used. The straw needs to be a heavy plastic one. Hi Carla, That is a great idea. Thank you for sharing. Hi Maurice, I don’t see why not? Let me know how it turns out.